32 ate shooting gallery to get himself in irim for a proposed African adventure. Ie is quite a good shot. What with the large "Harold Lloyd" spectacles he's wearing, there is no excuse for his missing. His girl friend, Eve, a well stacked blonde, and Kirkham's uncle, a well filled barrel, plead with him to forsake his daring trip. But Kirkham, stout fellow, will not hear any of it, and with squared shoulders firmly says he must go! At this point I had better mention that the picture was a silent production which is the only creditable thing one can say about it. Seeing this wholesale mass of corn displayed before your eyes is bad enough -- but hearing it too would have been too much, even for First National. Things start happening now. 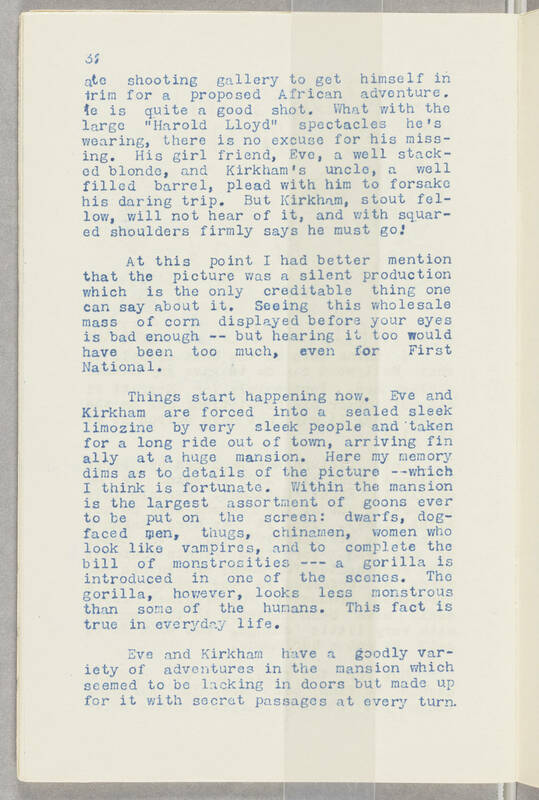 Even and Kirkham are forced into a sealed sleek limozine by very sleek people and taken for a long ride out of town, arriving finally at a huge mansion. Here my memory dims as to the details of the picture --which I think is fortunate. Within the mansion is the largest assortment of goons ever to be put on screen: dwarfs, dog-faced men, thugs, chinamen, women who look like vampires, and to complete the bill of monstrosities --- a gorilla is introduced in one of these scenes. The gorilla, however, looks less monstrous than some of the humans. This fact is true in everyday life. Eve and Kirkham have a goodly variety of adventures in the mansion which seemed to be lacking in doors but made up for it with secret passages at every turn.